One thing I’ve always appreciated as a Daredevil fan is that the character’s history is fairly uncluttered. Unlike many other characters, he’s only ever had one book, save for a few mini-series, and his team involvements have been minor. While I certainly wouldn’t complain if we could somehow get even more Daredevil, he’s an easy character to get into, in part because you don’t need a spreadsheet to track his most important appearances. 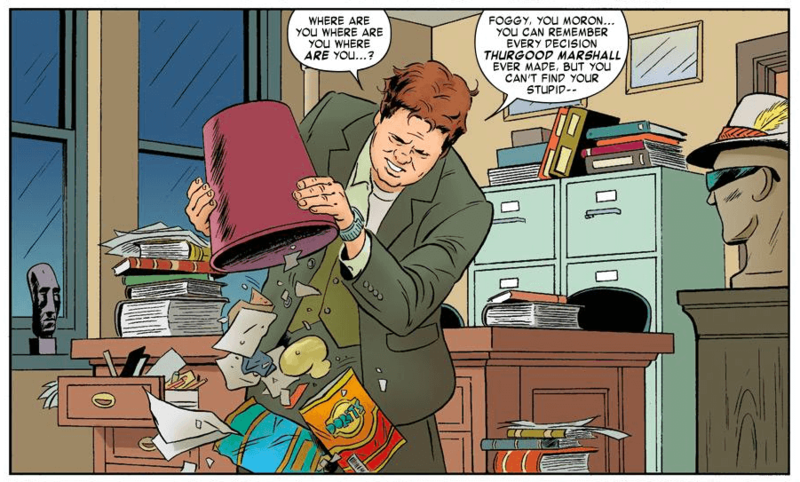 Some of Matt Murdock’s adventures obviously stand out more than others, and a fair share of them are completely forgettable, which means that there are several key moments that later writers like to return to. In that sense, many of the nods to past continuity we’ve seen during volumes 3 and 4 are in no way unique to this run. Stories involving Matt’s relationship with his father are common, as are mentions of Stick, all the heinous stuff that Bullseye has put Daredevil through over the years. 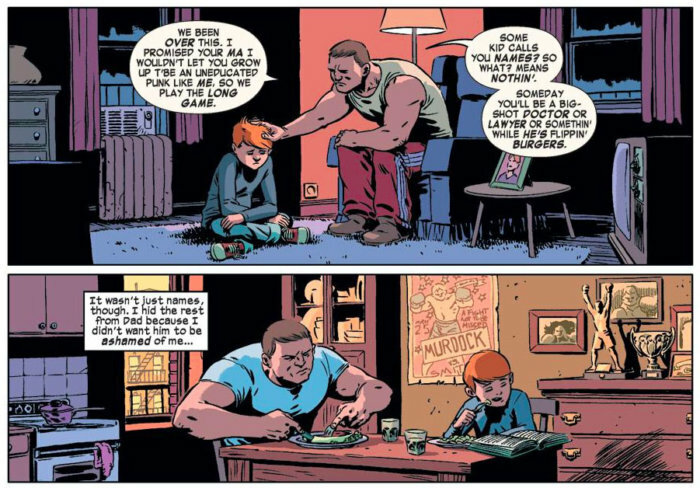 While I’ve appreciated the specifics of how these recurring bits of continuity have been included (see the adorable scene of Matt’s childhood below, courtesy of Javier Rodríguez), let’s take a look at some things that I felt set this most recent era apart. 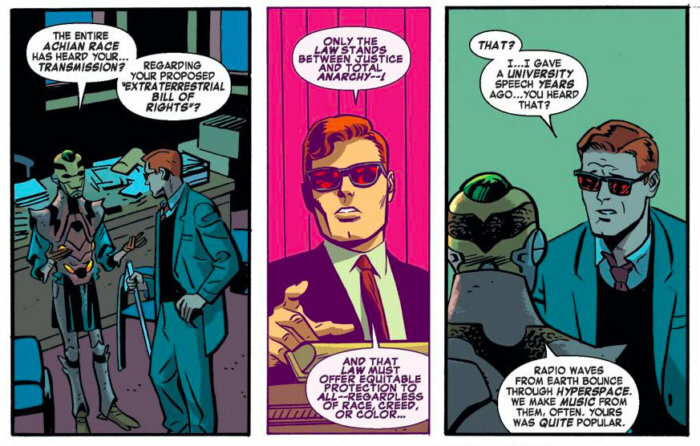 The Mike Murdock era, when Matt pretended to be his own made-up-on-the-spot identical twin – from Daredevil #25 through #41 (volume 1) – is regarded with an amused sense of disbelief by fans today. It’s the kind of story that seems like the complete opposite of what we associate with Daredevil today, which makes it difficult to address in any other way than through the use of clever Easter eggs. We’re not likely to see a scene in which Foggy questions Matt about the details of this particular ruse, because that would make it a little too real for comfort – as opposed to some kind of Silver Age hallucination – but it’s fun to play with. Even the very serious Netflix show did it (“Mike” was the name given to Matt by Claire, when he refused to give his real name), and during the Brubaker/Lark run, Matt used the name “Mike” to check in at the airport after breaking out of prison. Then again, his full name is Matthew Michael Murdock. In the panel above, we see a different kind of jab at Mike Murdock, in the form of his hat and glasses. The same accessories appear in later issues as well, and it definitely put a smile on my face every time it did. It’s just a small detail that doesn’t really detract from the scene, but rewards longtime fans for their loyalty. Just as a good Easter egg should. One aspect of the Silver Age madness that this run made sure to address more directly were the villains. 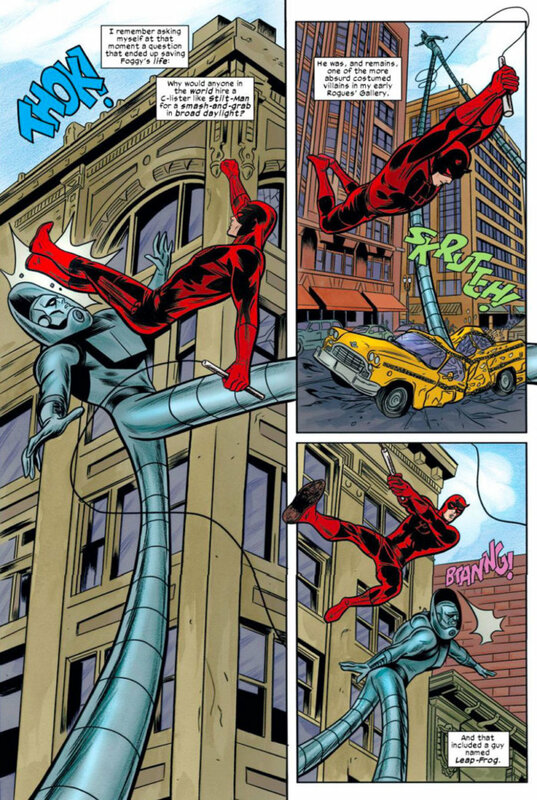 Above, Matt fights Stilt-Man in a story set in the past, at a time when fighting Stilt-Man was a more regular occurrence. Of course, Daredevil also fought an upgraded Stilt-Man in the present alongside the Superior Spider-Man, but in both instances Mark Waid put an appropriate amount of distance between the goofier past and the more grounded present by the way Matt himself narrates the events. If you’re going to include something a little nuttier from the past, acknowledging the nuttiness of it all, in some way, is more or less required. A different approach to using past villains, which used to great effect during this run, has been to dust them off and make them legitimate threats for the modern age. This will never work for Stilt-Man, who is inherently ill-conceived, but plenty of others have great potential for creepiness. Old Spider-Man villain the Spot has never been quite so disturbing (not to mention the similarly powered new character Coyote), and I loved the return of Klaw, who appeared in one single episode of Daredevil, decades ago. There was the update to Purple Man’s story (though he was always pretty disturbing), and many others. I thought this was a great way to use the past stories of not only this particular character, but the greater Marvel Universe. Another great use of the more obscure chapters of Daredevil history was the nod to Matt’s lecture at Carter College, about the legal implications of extra-terrestrial visitors to Earth (see below). Again, Matt treats the reminder with an appropriate amount horror, even commenting that he may not have been sober. The nod to past continuity is also wonderfully reflected by the art. For more on this, see my old post dealing with the same scene. These are just a few examples of the many ways past continuity was treated, ever so lovingly, by the creators of volumes 3 and 4. What are your thoughts on this topic, and do you have a favorite little nugget that I didn’t mention here? Let the rest of us know in the comment section! I hope that Soule, in the new run, explain why Daredevil has secret identity.. and not to forget Kirsten McDuffie! Please! Agreed. Waid’s knowledge of and nods to past continuity were, for the most part, a real strength of his run. One big mistake he made though, in my opinion, was still in that Original Sin issue when he had Matt say that Jack never laid a hand on him in anger. I don’t know if that was error or Waid trying to rewrite Daredevil’s history to suit his vision for the character. Jack hitting Matt, at least that one time, had become a very defining moment for the character and to toss it aside was wrong. And Klaw is definitely a character that Matt should tangle with more than once every few decades. There is also a lot of references to the previou arcs like in the last issue when the Kingpin say to Matt : “you shouldn’t have signed it”. It’s a clear reference to Born Again, but with the roles inversed.